Retailers such as Home Depot, Sears and Bosch are utilizing the newest 360 degree photography technology for their products. Now your company can too. 360 Degree Photography provides more access to visual information for the consumer. This can have a tremendously positive and measurable impact on conversion rates. It will also improve the perceived value of your brand. 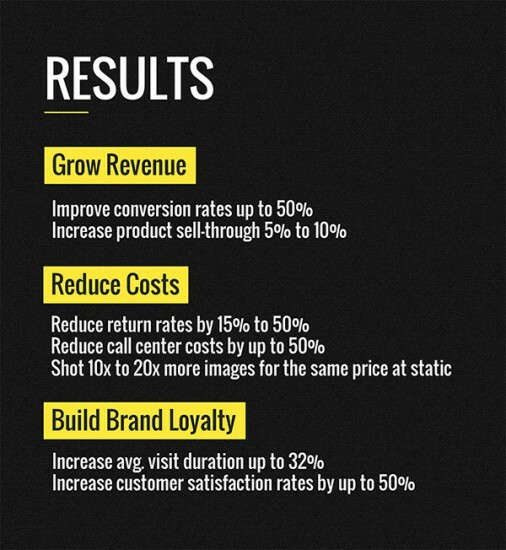 These digital images grow revenue, reduce cost and returns, build brand loyalty. Furthermore, they communicate your brand is forward-thinking. More innovative than competitors who are not utilizing the technology. From time on page to site engagement, our 360 Degree Photography services are the innovation to better showcase your products. dream ink works with the nation’s most innovative 360 degree photography services company. It is with their ingenuity, robotics and workflow software that we are able to offer the most visually stunning and interactive way to showcase your products online. This technology is proven to increase conversions and online sales for nearly any product. The bottom line: consumers want access to information at their fingertips. In addition, our photography, video production, and 360 Product Photography services have perfected the art of capturing the most impactful, eye-catching imagery while also providing the most immersive and engaging experience for web visitors. Set up your free 360 Product Photography consultation today. We will take your product presentation on the web to the next level.